Electronic Health Records (EHRs) have changed the face (and the pace) of healthcare. Not only do EHRs empower clinicians and physicians to provide better care, they also enhance the experience of patients―all because they offer better access to data. Click here to read the 4-minute article on EHRs in Sirius’ online magazine. Sirius is a national integrator of technology-based business solutions that span the enterprise, including the data center and lines of business. 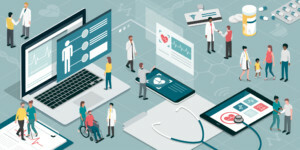 Sirius’ dedicated Healthcare Solutions practice provides a vendor-agnostic approach to address the unique challenges of our healthcare clients. Specifically, we support you through every step of the healthcare continuum and throughout the technology lifecycle to improve quality of care, control costs, enhance security, comply with regulations and extend reach to communities. Click here to schedule a discussion about your needs. Ed Ricks is a Director of Healthcare for Sirius Computer Solutions.